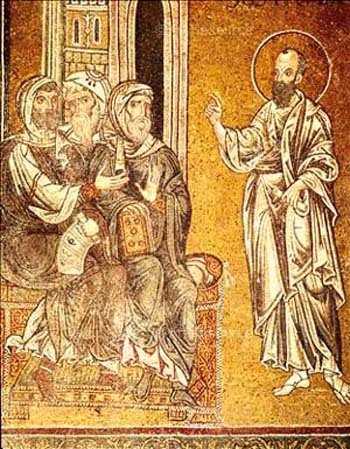 Acts 13 Among the prophets and teachers of the church at Antioch of Syria were Barnabas, Simeon (called “the black man”), Lucius (from Cyrene), Manaen (the childhood companion of King Herod Antipas), and Saul. 2 One day as these men were worshiping the Lord and fasting, the Holy Spirit said, “Appoint Barnabas and Saul for the special work to which I have called them.” 3 So after more fasting and prayer, the men laid their hands on them and sent them on their way. 13 Paul and his companions then left Paphos by ship for Pamphylia, landing at the port town of Perga. There John Mark left them and returned to Jerusalem. 14 But Paul and Barnabas traveled inland to Antioch of Pisidia. 17 “The God of this nation of Israel chose our ancestors and made them multiply and grow strong during their stay in Egypt. Then with a powerful arm he led them out of their slavery. 18 He put up with them through forty years of wandering in the wilderness. 19 Then he destroyed seven nations in Canaan and gave their land to Israel as an inheritance. 20 All this took about 450 years. 26 “Brothers—you sons of Abraham, and also you God-fearing Gentiles—this message of salvation has been sent to us! 27 The people in Jerusalem and their leaders did not recognize Jesus as the one the prophets had spoken about. Instead, they condemned him, and in doing this they fulfilled the prophets’ words that are read every Sabbath. 28 They found no legal reason to execute him, but they asked Pilate to have him killed anyway. 29 “When they had done all that the prophecies said about him, they took him down from the cross and placed him in a tomb. 30 But God raised him from the dead! 31 And over a period of many days he appeared to those who had gone with him from Galilee to Jerusalem. They are now his witnesses to the people of Israel. 34 For God had promised to raise him from the dead, not leaving him to rot in the grave. He said, ‘I will give you the sacred blessings I promised to David.’ 35 Another psalm explains it more fully: ‘You will not allow your Holy One to rot in the grave.’ 36 This is not a reference to David, for after David had done the will of God in his own generation, he died and was buried with his ancestors, and his body decayed. 37 No, it was a reference to someone else—someone whom God raised and whose body did not decay. 50 Then the Jews stirred up the influential religious women and the leaders of the city, and they incited a mob against Paul and Barnabas and ran them out of town. 51 So they shook the dust from their feet as a sign of rejection and went to the town of Iconium. 52 And the believers were filled with joy and with the Holy Spirit. Acts 14 The same thing happened in Iconium. Paul and Barnabas went to the Jewish synagogue and preached with such power that a great number of both Jews and Greeks became believers. 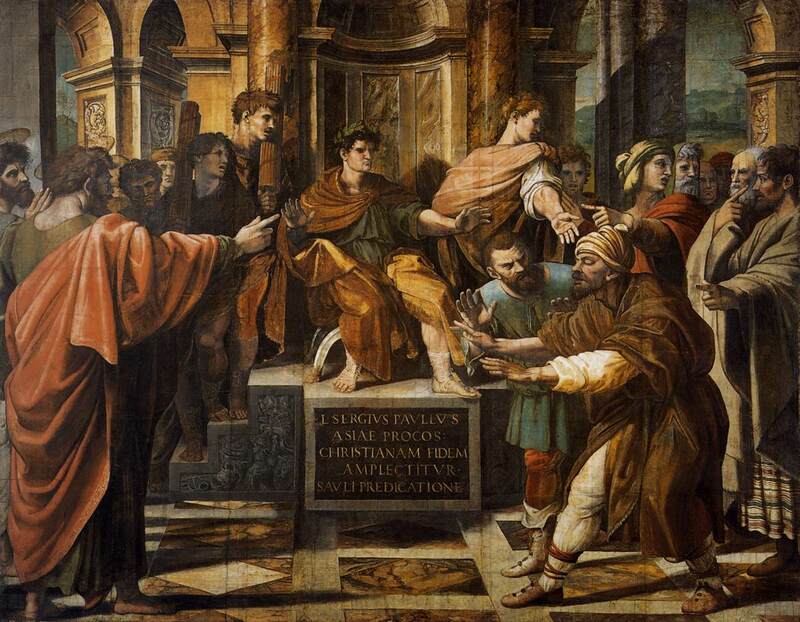 2 Some of the Jews, however, spurned God’s message and poisoned the minds of the Gentiles against Paul and Barnabas. 3 But the apostles stayed there a long time, preaching boldly about the grace of the Lord. And the Lord proved their message was true by giving them power to do miraculous signs and wonders. 4 But the people of the town were divided in their opinion about them. Some sided with the Jews, and some with the apostles. 11 When the crowd saw what Paul had done, they shouted in their local dialect, “These men are gods in human form!” 12 They decided that Barnabas was the Greek god Zeus and that Paul was Hermes, since he was the chief speaker. 13 Now the temple of Zeus was located just outside the town. So the priest of the temple and the crowd brought bulls and wreaths of flowers to the town gates, and they prepared to offer sacrifices to the apostles. 14 But when the apostles Barnabas and Paul heard what was happening, they tore their clothing in dismay and ran out among the people, shouting, 15 “Friends, why are you doing this? We are merely human beings—just like you! We have come to bring you the Good News that you should turn from these worthless things and turn to the living God, who made heaven and earth, the sea, and everything in them. 16 In the past he permitted all the nations to go their own ways, 17 but he never left them without evidence of himself and his goodness. For instance, he sends you rain and good crops and gives you food and joyful hearts.” 18 But even with these words, Paul and Barnabas could scarcely restrain the people from sacrificing to them. 19 Then some Jews arrived from Antioch and Iconium and won the crowds to their side. They stoned Paul and dragged him out of town, thinking he was dead. 20 But as the believers gathered around him, he got up and went back into the town. The next day he left with Barnabas for Derbe.